Cycle Chic®: Cycle Chic Breakfast Winners! The first order of business at the Cycle Chic Bloggers Conference in Barcelona was an event organised in conjunction with BACC - the Catalonia Bicycle Club. The Cycle Chic Breakfast was a part of the city's Bike Week. In the morning last Friday at three locations around the city red carpets were rolled out for the city's cyclists from 7:30 to 10:30. To thank them for cycling in the city and to make them feel loved. Free beverages and breakfast were handed out, too. The Cycle Chic bloggers were dispatched to the three locations to photograph the Citizen Cyclists. At the end of the brilliant day we selected winners in two categories. "Cycle Chic is about looking fabulous on a bicycle but it is also about personal style. Paulette looks wonderful in her outfit and sunglasses and the fact that she rides a cool, old bike that she hand-painted herself made it easy for us to choose her as the winner." Paulette is the proud owner of a cool new bicycle from Hood Bikes and a rain coat from Italian brand Abici. "This guy was brilliant. He really went to an effort to go crazy and we love his daugther on the back. We see it as cool irony that he is wearing spandex shorts. 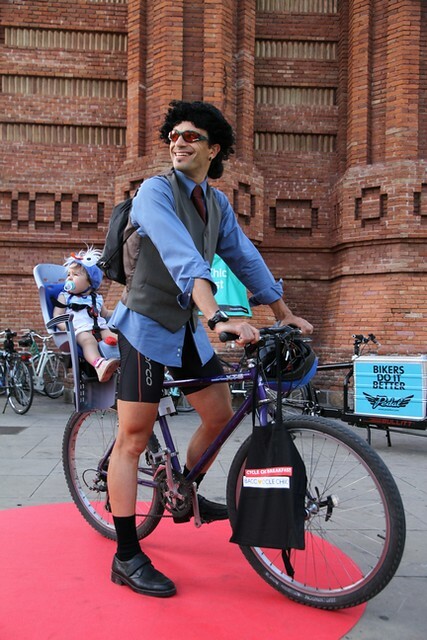 We have humour at Cycle Chic, and this guy has it all going for him. His daughter was adorable, too!" Raul won a selection of bicycle accessories from cool Barcelona brand Ramonas and a rain coat from Bordeaux brand Nooc.fr. We're still working on the runners up, too. Here's a slide show of many of the photos our Cycle Chic bloggers took on the day. Copenhagenize Consulting has more great Cycle Chic events and bicycle events on the way. Barcelona is a great city !